H - Holds lid tight while ring is placed on ring seal drums. NOTE: To close more than one size or type of container, special attachments may be necessary. The closers can be quickly installed by your present plant personnel. The only connections to be made ore to your own 3/8" plant air line; on machines with motorized conveyors the motor must be connected to a switched connection. Motors may be provided in all 50 and 60 Hz electrics. Conveyor height of the CRS and CRA model machines are made to meet your existing conveyors. The lids are placed on the pail before entering the machine. The machine automatically indexes the pail, closes, and discharges the pail. The operator places the lid, moves the pail beneath the closing head, then presses the two operating buttons. When the operator releases the operating buttons, the closing head returns to its up position. On the CRS/220, the pressure head remains down, holding the drum lid tight while the operator places the ring clamp, the pressure head rises when the operator presses the release button. The operator places the lid, moves the pail below the closing head then presses the two operating buttons. This model does not include legs or conveyor. Crimper heads on CRT, CRS and CRA models can be changed with little effort -simply release the lock nut and the closing head threads off the holding shaft. Height adjustment is done by use of the rack and gear system. On CRA models, can guides are easily adjustable to accommodate different size pails. 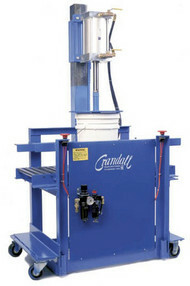 Crandall crimpers are designed so that no technician is necessary to make minor repairs. All bolts and fittings are standard sizes and require no special tools. No operator is necessary at the machine. The lids may be placed before discharging the container from the filling machine. A guard is at the closing station. A two-hand-anti-tie-down system requires the operator to use both hands to operate the machine. * All models are totally non-electric in operation. Motors used for motorized conveyors are Class 1, Group D, Explosion Proof: UL and CSA approved. 4 cu. ft. at 80 p.s.i.g. per minute (125 liters at 5.7 kg/sq. cm). (Standard on CRA/60): Aids infeed of containers to the machine. Recommended for products which are not lubricants. Required for machines closing containers smaller than 5 gallons (20 liters). For closing more than one size or type container on the same machine. Specially designed machines may be manufactured to meet your special requirements.